I normally play h2demo but decided to play full version heroes 2 to see my scores. These are my scores after 4 games, which I think are pretty good. But I don't know if they're actually any good - I don't know how advanced the h2 community is, and I'm curious to know. Some disclaimers: for the worst score I didn't use any saves/loads. For the other 3 i used saves to my advantage quite heavily. But I'm certain I can get the non-save score to below 40 days. If anyone wishes, I can record a run and publish it. EDIT: I can't get the picture to work. I Can't post links. Says I need to wait 7 days. Well, I have serious doubts if there is any need to compete in the non-save mode since Heroes 2 is a game of chance and many things really depend on what is generated in your Mage Guild, what heroes are available at start (since even their skill leveling sequence, starting army and secondary skill tree are pre-defined at start of the game), and at the same time many nearly impossible combats can be won via finding the correct action sequence, i.e. luck contributes to the skill. Basically, all this is considered in offline tournaments where you actually spend the most time calculating properly and reloading to get the ultimate result, so you are welcome to participate. Thank you so much for the reply! This helped me a lot: justifying the use of save/load just saved me a lot of time! I assume it is not acceptable to save the game, find all the obelisks, load & therefore be able to dig the artifact at first week? Because I did that in the 28 day "record". Edit: I'll try to find out about offline-tournament rules, maybe that will answer my question(s). Edit 2: I think I found answers to most questions I was pondering after reading the rules. Interesting! Yeah, usually the offline tournaments consider most of the game "flaws", prohibiting the "rehired hero" trick to prevent spell spamming and such. The hero chain, though, is considered a "feature" and is a necessary part of every speedrun. I occasionally provide info support for tournaments here on the forum, but I would prefer if someone else did it. Anyways, people don't seem to care so much. There is only one regular Heroes site which still maintains a set of tournaments every year, and it's mainly Russian. See Tournament Arena subforum for details. Some 15 years ago we had off-line Round Table Battles, which in many cases did not have starting saves or much any rules, at Celestial Heavens. 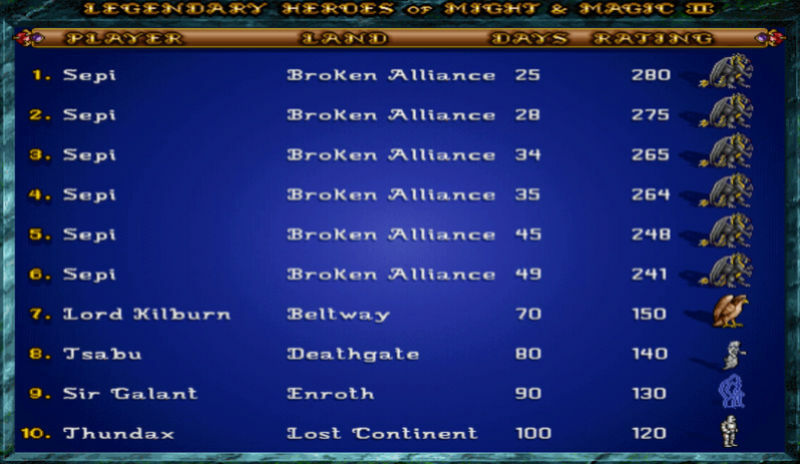 Broken Alliance was played, but I do not remember the top scores anymore. Found only a later comment mentioning 4 weeks. Considering the map layout and enemies 28 days may be about as fast as one can be. Dunno if the ultimate artifact is really necessary for that, though. Saving and replaying the same save helps a lot to optimize the "random" events in your favor though, as Orzie said. I was improving my strategy and I did the broken alliance within 25 days without the ultimate artifact, and basically trying to follow the tournament rules. But even with this score my strategy was suboptimal and improvements could be made. At what difficulty did you and your friends play the map? You mentioned days but not difficulty. I am quite strict with these kinds of mentions, you can play all sorts of mind tricks if you don't mention things like this. The highest difficulty is the standard in player vs AI games. In these tournaments I told about the score was the first criteria. In H2 it means the least days at highest difficulty. In H3 it was more interesting since score was not solely time dependent anymore. For instance H3 version of Beltway was won in 3 days, but the highest score was in a 6 day game. 3 days for Beltway is surely a sick result even for Heroes 3. Too bad there is a too small amount of gameplay videos showing such fast plays. My favorite ones (because they are the only I know ) are these Pandemonium and Pyramid videos. Pretty sure they also could be made faster, but for some reason YouTube has been always neglected by top Heroes offline players. Pandemonium should have a better result indeed since we have 6 heroes at start. May need a lot of time for reloading though, and a player would be able to catch the infamous Heroes 2 bug with broken AI fights more easily. Some may consider it a feature though, and there were precedents of using it in tournaments which led to numerous debates on HeroesPortal.net. Wow that pyramid video! Really opens my eyes about how crude my technique is and how advanced the technique can be. Very nice!